The Yaegers have their studio, Studio Solstone Ltd., in the Atrium of Seattle's Pike Place Market (behind DeLaurentis, and to the left of Pike Place Fish. If you can't find what you need on this website please come to the Market! Here I am working on location as always. I specialize in watercolors but also work in oils and acrylics. If you have any questions about our other products (we have posters and notecards as well) please ask me. Here are some of my watercolors of Seattle, Pike Place Market and the Puget Sound. Click on my husband Michael Yaeger's page, Michaelyaeger.com Michael is the writer/publisher of our calendar. He also wrote "The Insiders Tour of the Market"(6.95 tax/ship incl) and, under the name of Michael Dovell, "The Dahlia Connection," a mystery set in the Pike Place Market (13.00 tax/ship incl). You can learn about these books, MIchael's art, and a lot more on his page. He is also Honorary Mayor of the Pike Place Market. Click here to visit the Mayor's page and learn more about the Market. Upon graduating from the University of Michigan, College of Architecture and Design, Sarah worked as Assistant Buyer for the Lord & Taylor Art Gallery of New York City. In 1968 she went to Rome to begin a series of oils depicting classical Italian cities. In 1971 she marries abstract artist Michael Yaeger on the Capitoline Hill, Rome. They then travelled through France where they saw the countryside that had so inspired her grandfather, C. Harry Allis, a noted painter in the impressionist style. After moving to Spain, Sarah and Michael opened "Studio Solstone" in a 17th-centry house in Altea, on the Costa Blanca. 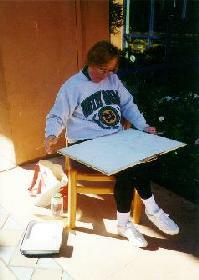 In 1975 she initialed a series of watercolors of Spanish villages. All her exhibitions were sellouts and she now has collectors all over the world. A top Spanish art critic dubber her and her husband "Los congncentes de antique Espana" (friends of Classic Spain) for their work in documenting Spanish villages. I specialize in watercolors but also work in oils and acrylics. If you have any questions, just ask me. Since early times this areas native Americans were literally cut off from the rest of the country by mountains to the East and North, and by the mighty Columbia to the South. Their pristine world was connected to Alaska by the ocean. It was this isolation that produced one of the most sophisticated self-contained cultures know to man. This legacy is shared by the settlers who in turn had to make just about everything they used themselves...from wooden spoons to eventually BOEINGS. In fact, wooden spoons are still made by hand at the Pike Place Market. Our country centers on Puget Sound, an inland sea filled with lush islands available only by water. This area is verdant because the air is thick with moisture condensed by the mountain ranges ( the Cascades and the Olympics). The Cascades are anchored by Mount Rainier which is so massive that it sustains its own glacial system. From the top of the mountain to the heart of the Market, we welcome you to Puget Sound Country. Happy Scrolling and don't forget: Send watercolors fresh daily.